I love Typography. When I showed my portfolio around during my final year at design school, I was encouraged with these words, “Your work and attention to detail is great. Don’t forget about type. Poor typography can really take down good design ideas, so pay attention.” I’ve kept that close to mind since and up to this past year. I’ve had my nose down to the grindstone working hard, long hours, ensuring typographic choices were always considered from both style and historical perspectives, as well as accessible (readable, affordable, cross-platform and within all brand applications). I also didn’t want to burn out creatively from overwork either. I began paying attention to online resources for learning, stumbling upon videos from the Type@Cooper program in NYC. That led me to the Typographics design festival at Cooper Union, which debuted last year. I don’t attend conferences as often as I would like, but It’s been 7 years since I was last in New York, so due time for a return to a city overflowing with designers, typographers, galleries, and creative folks. As a regular member of Vancouver’s Type Brigade meetup, my friend Riley Cran was also going to be a speaker. What better way to represent and support, as well as get invaluable inspiration, experiences and learning? Suffice to say, I was already stoked. Arriving in NYC, the energy was palpable. The noise, the people, the traffic, the food (! ), the architecture, the wealth of excellent galleries/museums and the wide range of cultures. Typographic design influences were everywhere, as evidenced by modern and historical works alike in subway advertising, storefronts, packaging, carved facades, graffiti, and especially building signage. Everything is vying for your attention, and BIG or LOUD is the preferred visual language. I kept busy capturing as much as I could, posting images on Instagram and soaking all of it in to take back with me. So too, was the positive impact of attending a type design conference where most presenters were already working and living in Manhattan or Brooklyn. The range of Typographics speakers included those starting out designing their own fonts, to seasoned type designers, to those looking into the past exploring deeply into type ephemera or through career achievements, right to those with their eye on the prize towards the future. The conference talks were eye-opening, aspirational, experiential, and entertaining as expected; often meaningful, thoughtful and personal too. Many speakers were brilliant storytellers, while others let the work do most of the talking. I was pleased most of all that each person on stage—whether from Brooklyn or by way of Thailand, UK, Germany, Italy, Spain, Mexico or Canada—had made typography a passionate, vibrant and always integral part of their life’s work. They are each interesting individuals and thus, their desire or personal calling to make typography a strong, positive influence in what they do and HOW they do it is evidenced in everything they thought about or shared. That was also true with Herb Lubalin, of whom I am equally ashamed and grateful to discover so late. During my design school education (which lacked any design history in the curriculum), I was unapologetically entranced and influenced by Duffy Design & Charles Spencer Anderson, that graphic retro illustration, xerox machines and brown kraft paper was my main design jam. Years later, I am pronouncing LOO-BAAHL-LIN properly and appreciating his many contributions to design with a student-like curiosity and fervour. I was fortunate to get a self-directed tour of “The Herb Lubalin Study Centre of Design & Typography” (aka the Lubalin Center) in the gorgeously curvaceous Cooper Union building across from the original Foundation Building where the 2016 Typographics conference was held. For 2 hours I was given access by curator, Sasha Tochilovsky, to explore the vast wealth of materials gathered and contributed by various parties that built up this fascinating collection. Drawer after large map drawer of Lubalin’s sketches, tracing paper composites, pasteup boards, PMTs (high quality solid black prints on photographic paper), negatives, tearsheets, brochures, postcards, stationery, outtakes, advertising, logos, type designs, posters, articles, and so on. Basically his entire life’s design work and process is there, along with smaller collections from other designers of similar calibre (Phillippe Apeloig, Alexey Brodovitch, Karl Gerstner, Tibor Kalman, Milton Glaser, Paul Rand, Alvin Lustig, Chip Kidd). I felt like I was a private investigator, design journalist and archivist all in one. This visit was visually documented here. It was NOT hard to fill those 2 hours as I explored every single piece with the attention it deserved, as though it may be my last chance. 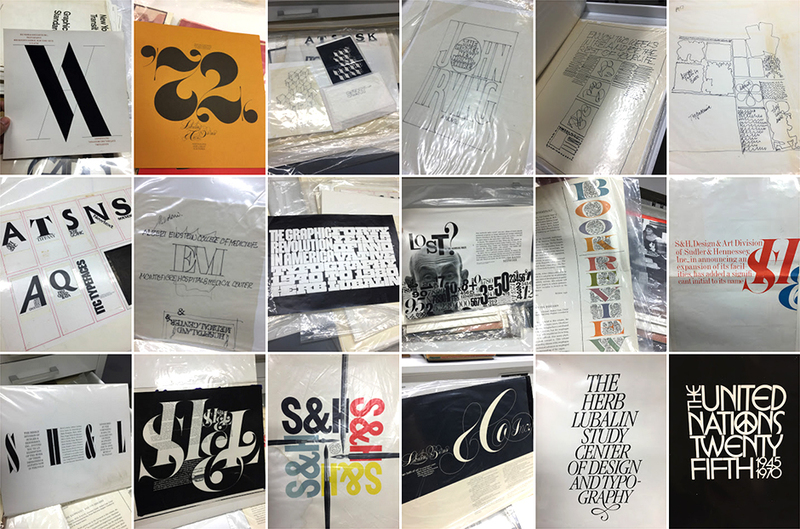 The opportunity for archives like this to exist for the public good, and to be maintained and nurtured so lovingly, at a place where quality typography courses and lectures (some captured on video and posted online) is a testament to how highly regarded the Type@Cooper program and school is. Two of the speakers at Typographics (Emily Oberman of Pentagram and Stephen Doyle) were proud Cooper graduates. Their high level of passion and talent for what they continue to create demonstrates how much typographic design impacts everything they do. As I write this, I am hit with a wave of gratitude for having attended and still feel how much it has influenced me even after a month has passed. 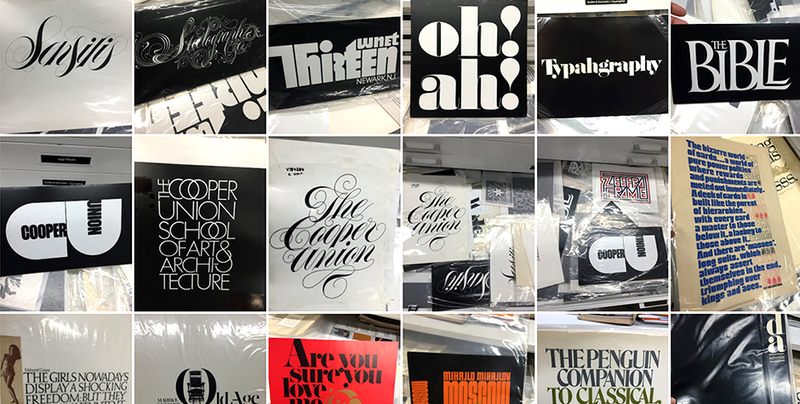 For those unable to visit the Lubalin Center in person, or Letterform Archive in San Francisco (a similarly much larger archive from worldwide masters), there are options. Both have visual archives on their respective websites and Instagram. 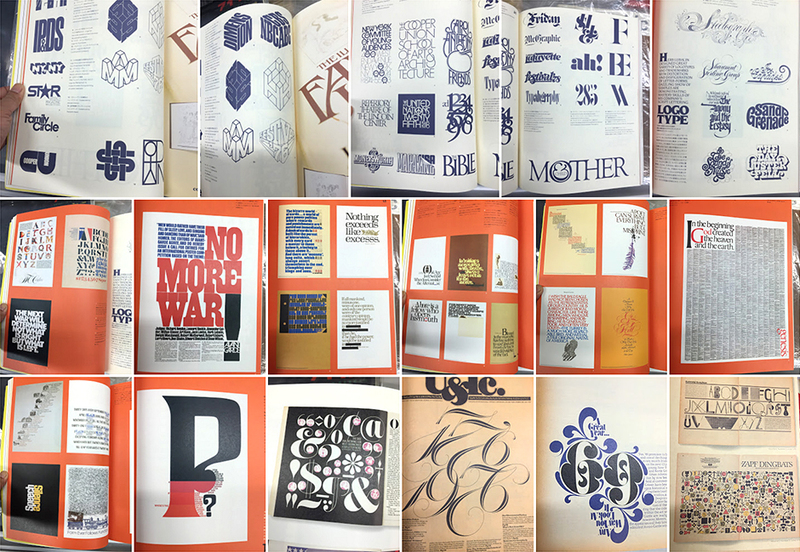 Alternatively, UK design book publisher Unit Editions has just released Herb Lubalin: Typographer. I received my copy upon my return from NYC and it’s much of what I saw in the drawers in an affordable and beautifully designed book. So what’s next? There’s Typecon Seattle, and one day I would love to attend Brand New Conference (their 2010 & 2011 videos are now FREE, btw) although Typographics 2017 is definitely worth another NYC visit! So many conferences, so many typographic options... I hope you find yourself attending a conference too, gaining and sharing inspiration with others to spread the beauty & potential of typographic design!